years. Heidelberg Township (which at first included Washington and Slatington Townships) opened for settlement in 1736 with an influx of immigrants from Germany and Switzerland. By around 1740, these settlers had begun to organize into Evangelical Lutheran and Evangelical Reformed Congregations. These meetings formed the foundations for our two current congregations--Lutheran and UCC (formerly Reformed). In 1744, the two congregations "erected a church in which to hold divine services as long as we live... in order that we may serve God in our neighborhood in peace and harmony...for ourselves, our heirs and descendants". For over two and a half centuries, Heidelberg Union Church has fulfilled that promise, serving God in our community. 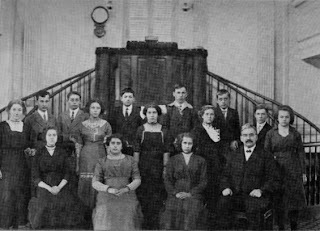 The heirs and descendants of those original founders can be found among today's congregants--Rex, Newhart, Oswald, Hoffman, Peter, Hunsicker, Blose, Lauchnor, Rehrig, Geiger, German, and Handwerk*. In 1757, the second church structure was built. The agreement between the two congregations discusses how the costs would be shared between the congregations, even down to how many acres of farmland and how much timber the schoolmasters were allowed to clear. By 1772, all of the land in Heidelberg Township was occupied by 117 families, almost of all of whom were church members. As the population in the township continued to grow, the church outgrew the 1757 structure. In 1787, the third church structure was built. It was made of wood--most likely logs--and measured 42 feet long by 34 feet wide. 1859 - A Kronleuchter-Lampen--a large chandelier--was installed in the sanctuary, allowing evening worship. In 1928, this was replaced with electric lights. 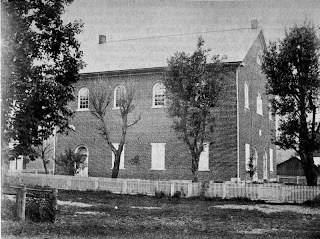 1881 - A new schoolhouse is built for use as both a public school and for Sunday School up until 1951. This structure was used as the original Fellowship Hall until 2008. 1912 - Singing and hymnbooks were switched from the German language to English. 1957 - Educational building added to the rear of the church and Narthex added to the front. 2008 - A new Fellowship Hall is constructed on the site of the original. We value the unique heritage, and understand our inherent responsibility to preserve our past while striving to glorify God in the present and future.